Whimsy Bag - Retail $10.00 [LGD206] : Wholesale Purse Patterns, Purse Patterns at wholesale prices for quilting shops, craft stores, and fabric shops. 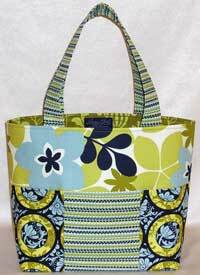 The Whimsy Bag tote pattern is a great all-purpose tote. With six large exterior pockets, this bag is ideal for everything from a sewing tote to a diaper bag. Fill this easy to make bag with whatever meets your whimsy. Features: Six large exterior pockets, lined interior and padded handles. Finished size approx: 17" wide x 11" height. The Bag-E-Bottom A is available for this pattern and gives your finished handbag a professional look!